Lindsay* is a technical specialist in the computer software industry with an impressive track record acquired from time spent at three leading companies in the field. She was one of a very few in the US with this specific skill set, and because the area was becoming an increasingly critical variable in the profitability of software firms, head hunters wouldn’t leave her alone. Lindsay’s decision to move to this smaller competitor was based on a number of factors, including the promise of a Vice President title after a few successful months on the job. She had been on the job for about a year and had just received her promotion when her HR Business Partner suggested that she hire an executive coach. The feedback Lindsay had received from her HR Business Partner and her boss, an Executive VP, was that she needed to improve her executive presence. This was a fairly broad and vague assessment, and even Lindsay was unclear about what should change. I spent some time with her, learning about her history, values and drivers, personality and behavioral style, job satisfaction, relationships, and current challenges. She had attended a few leadership development workshops over the years, and I reviewed some assessments and outcomes from these programs. I gave her just one other self-assessment to round out the picture for both of us. What I saw was a high-achiever, who was driven and passionate. She was also torturing herself with constant doubts that she had over-sold herself, making her irrationally anxious about keeping her job. By shadowing her in meetings where she played a key role, sitting in on some of her presentations and observing a session with her leadership team, I saw how this all showed up. 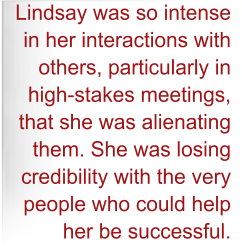 What I had heard from others was confirmed by what I saw first-hand: Lindsay was so intense in her interactions with others, particularly in high-stakes meetings, that she was alienating them. Her peers did all but roll their eyes when she spoke, which was far too often, and her direct reports became anxious around her nervous energy. The executives, including the company President, were impressed with her knowledge, but felt overwhelmed with too much detail and her high-speed delivery. She was losing credibility with the very people who could help her be successful. As I played back to Lindsay what I had seen and heard, we began to explore what was behind her intensity. Not surprisingly, she felt like the spotlight was on her and it was getting very hot. She had been hired to do something that was potentially pivotal to the company’s future and that was very difficult. She had also been promoted fairly quickly after her arrival, which didn’t go over well with a lot of people, especially her peers. While she was very competent, and with a good team behind her, she could make a great contribution, Lindsay felt the need to assure everyone that she knew her stuff and that everything was on target. She was showing up as self-promoting, inappropriately talkative, overly eager in her presentations, and very demanding of her team. The executives saw this as a lack of self-confidence and polish, which was the kindest and probably the most accurate assessment. But her peers sensed a competitive drive that felt like one-upsmanship and finger-pointing, and they were offended. Her direct reports and their teams were afraid of her. Lindsay’s sense of urgency, which never let up, had them running in circles. They were getting burnt out and some were looking around for other opportunities. On hearing this, Lindsay was despondent. She had had no idea that this was how she was coming across. To her credit, she was able to get beyond denial and remorse fairly quickly. But she was so intent on responding to the feedback and changing her behaviors, that she missed the point. First, she had to work on understanding what was behind it all. Where did the needs to assert her positions and prove herself come from? Once we explored and understood that better, we talked about other perspectives she could take, such as looking at what her constituents needed most and how could she provide that. Meeting their needs was exactly what would prove her worth and make her successful, and she got that. So she had conversations with partners, teammates and direct reports that taught her more about what was important to them. These talks also helped them see Lindsay as open to feedback and eager to improve, which went a long way toward turning those negative perceptions around. About 15 months into our coaching, Lindsay’s developing self-awareness and self-management were tested when the company reorganized and her group was moved to report to another Executive Vice President, also one of the very few senior women in the organization. Unfortunately, she and Lindsay had had a few rough spots. Lindsay had been working on the relationship, a little begrudgingly, but she had no choice at that point but to make it top priority. This was her opportunity to practice letting things go, and again, trying on different perspectives was very helpful. Together we thought through where her new boss might be coming from and what feelings could be at work. This helped Lindsay set aside her differences and relate to the EVP authentically, with a genuine empathy for her, instead of faking it. I worked with Lindsay for two years, and I watched her pay more attention to the effects she had on others and herself, recognize that she provided enormous value to the company, and replace frenzy with a calm assurance of priorities. 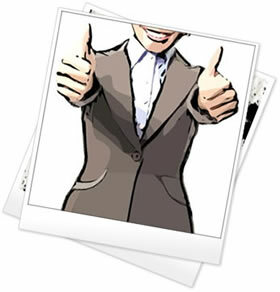 The company is growing fast, and her role is becoming increasingly complex. 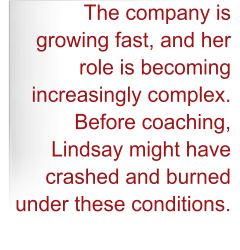 Before coaching, Lindsay might have crashed and burned under these conditions. Ironically, her intense drive to excel had led her to behave in such a dysfunctional way that she may have lost out on the opportunities that motivated her. Through our coaching, she grew into a highly-effective executive, experiencing all that she had envisioned for herself – more and more challenging work, influence on industry best practices, recognition as an expert in her field, and a very comfortable life-style. * Lindsay is a real person and her story is true; but Lindsay is not her real name, and a few other minor facts have been changed to protect her anonymity.